“YOU are wrong if you think everyone has a choice,” says one character in “Good People”, a new play by David Lindsay-Abaire. Set in the hardscrabble neighbourhood of South Boston, “Good People” tackles issues of class and raises uneasy questions about the role of hard work, decisions and plain luck in determining the course of one’s life. The play opens in a bleak alleyway behind a dollar store as Margie, a single mother in her 50s with a grown disabled daughter, is fired from her job at the shop. At first she fights back but her barbs quickly turn into desperate pleas; she pitifully offers to take a pay cut from her $9.20 hourly wage in a bid to stay on. Through a gossiping friend, Margie hears that Mike, an old boyfriend, has become a successful doctor. He escaped the “black hole” of South Boston decades ago but she tracks him down in search of a job. Though just a subway ride away, Margie and Mike live in different worlds. Margie finds herself a fish out of water in Mike’s home of insured crystal vases and artisanal cheeses. Tensions rise between Margie, Mike and his wife. All three characters consider themselves “good people”, but as sobering secrets are revealed, the notion of what that actually means becomes blurred. At its heart, “Good People” is a meditation on class, social mobility and the viability of the American dream. This play holds a special significance for Mr Lindsay-Abaire. He grew up in the blue-collar Irish neighbourhood in which the play is set. This is the first time in his career that he returns to “Southie”, as residents refer to it. “I had wanted to mature as a person and as a writer. If I was going to write about Southie, I wanted to do it responsibly and respectfully,” he told Charles Haugland, an adviser at the Huntington Theatre Company in Boston, where the play is now running after a successful debut on Broadway last year. Mr Lindsay-Abaire can certainly claim to have matured: he won a Pulitzer prize for drama in 2007. Mr Lindsay-Abaire strove for authenticity because he grew up working class himself. His father was a fruit seller and his mother a factory worker. In his youth, the playwright spent summers helping to sell peaches near the Huntington. He also frequented the local Boys and Girls Club, a non-profit youth centre, where his talent for writing was encouraged. He was eventually rewarded by the club with a six-year scholarship to Milton Academy, a prestigious private school near Boston. Mr Lindsay-Abaire, now 42, still brims with gratitude and amazement at this life-changing break. “I’ve tried really hard not to forget who I am and where I came from, and all those mentors who made my life possible,’’ he says. He also sought to depict real, working-class folk in South Boston beyond the stereotypes of criminals, mobsters, drunks and racists. 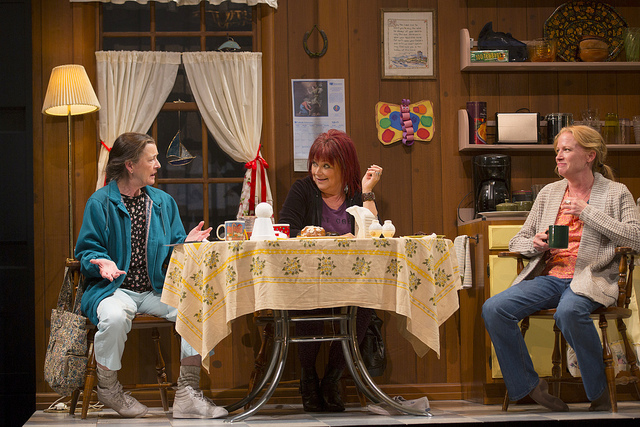 The Boston production, directed by Kate Whoriskey, resonates with the local audience, which understands references to specific neighbourhoods and appreciates touches like a Dunkin’ Donuts box on a kitchen shelf (the chain started near Boston and is still headquartered there). But the play is far from parochial. Its broader theme, especially timely in an election year, is part of an anxious national conversation about the tattered American dream of opportunity, hard work and meritocracy. Mr Lindsay-Abaire wrote “Good People” in 2008 as the global recession simmered, shortly before a sense of disenchantment boiled over. “Sadly, the play is way more relevant now than when it was on Broadway,” he says. Yet despite rising inequality and greater public engagement in the topic, class remains an under-explored theme in American drama. Mr Lindsay-Abaire hypothesises that class in America is “such a malleable topic. It is hard to pin down and talk about in a strict way.” Yet that is exactly what he manages in “Good People”.